Comments - Terrific kabuki scene from the play "Kotoba no hana momiji no sakari" of men arguing outside a temple. 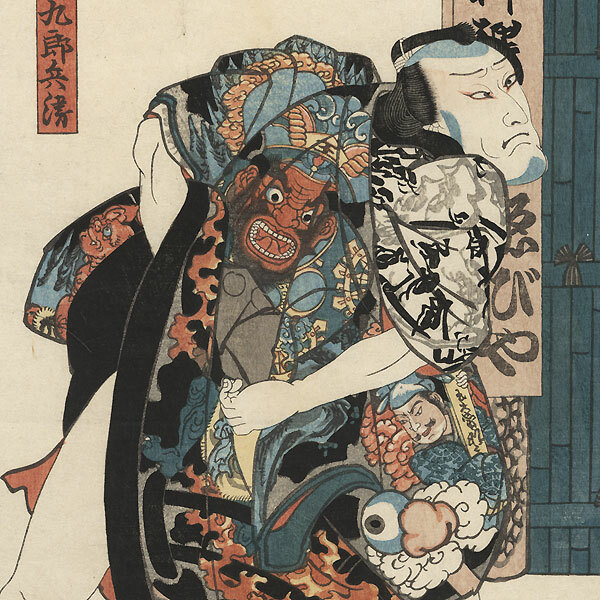 In the center, Hatoki Kurobei, leans forward with a grimace as he tucks up the back of his kimono, which features a fantastic scene from Hell with Emma-o, the lord of the underworld on the center back. 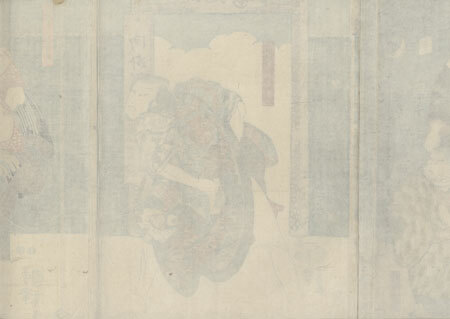 At right, Honcho-maru stares back at his companion with a worried frown as he likewise tucks up his robe. At left, Kanto Kurobei watches with an evil grin, a folding fan in hand. The young boy Kanda Yokichi stands beside him holding a small staff, his other hand resting on his sword. The temple grounds are enclosed by a bamboo fence, with a rustic wooden entrance gate in the center, stone lanterns at left, and paper lanterns protected by roofed stand at right. The actor in the center is Seki Sanjuro, while the actor at right is Nakamura Utaemon IV. A handsome design with expressive figures and wonderful detail. Image Size - 14" x 29 3/8"
Condition - This print with excellent detail as shown. Three attached panels, backed with paper. Slight separation at ends of two vertical folds, repaired. Slight soiling, a few creases and small marks, slight rubbing at edges. Please see photos for details. Good overall.